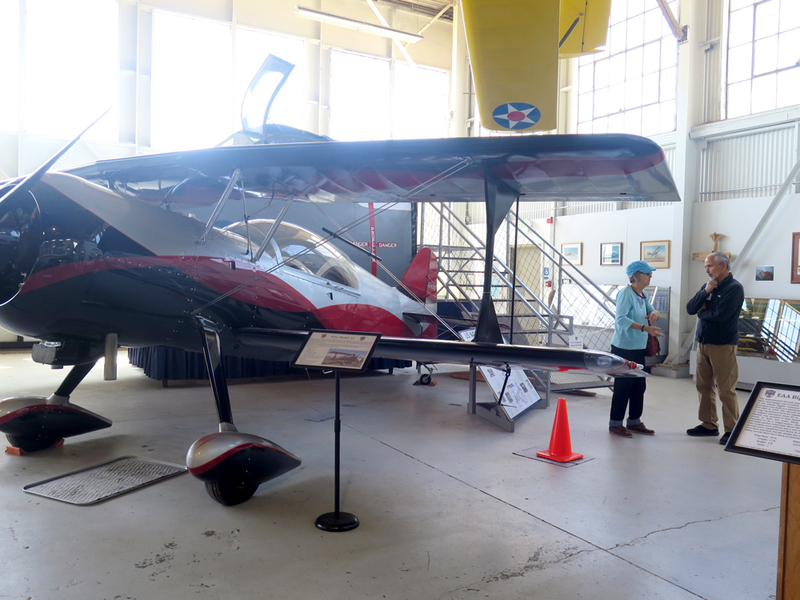 April meeting was held on Thursday the 19th at the Chico Air Museum. 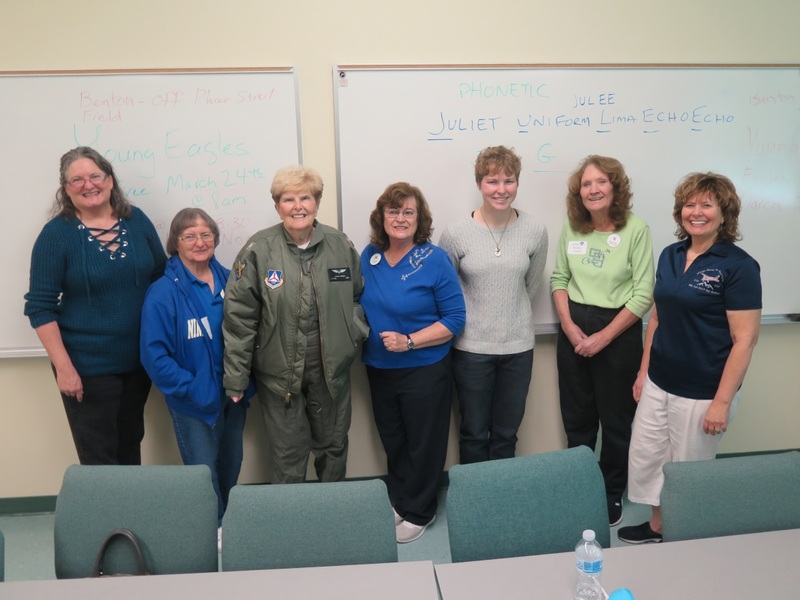 Attending members were Julie Ostendorf, Barbara Boots, Lerose Lane, Heather Jay, Julee Garrett and Christine Potje (who flew in her Cessna 182P from Woodland). Christine noted that the wind was pretty breezy which made it a little bit fun to land at Chico Muni. She was heading to Benton O85 afterwards to teach the IFR ground class that is held every Tuesday and Thursday. Most of us bought our lunch at the nearby Foodies café just around the corner from the museum. About 200 middle-school girls headed to Simpson University in Redding for the 2018 Women in STEM Conference. Many technical career options were presented, and our Mt. 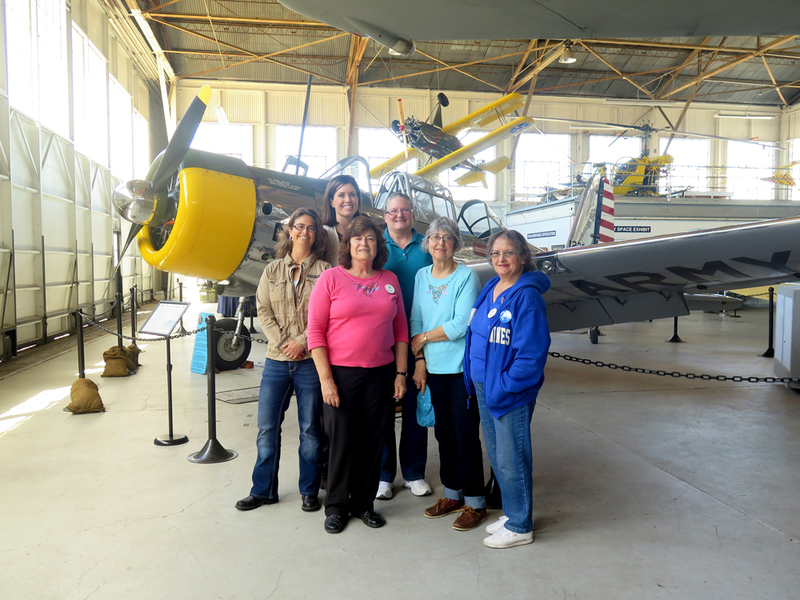 Shasta 99s presented a section on Aviation Careers and Discovery Flight. 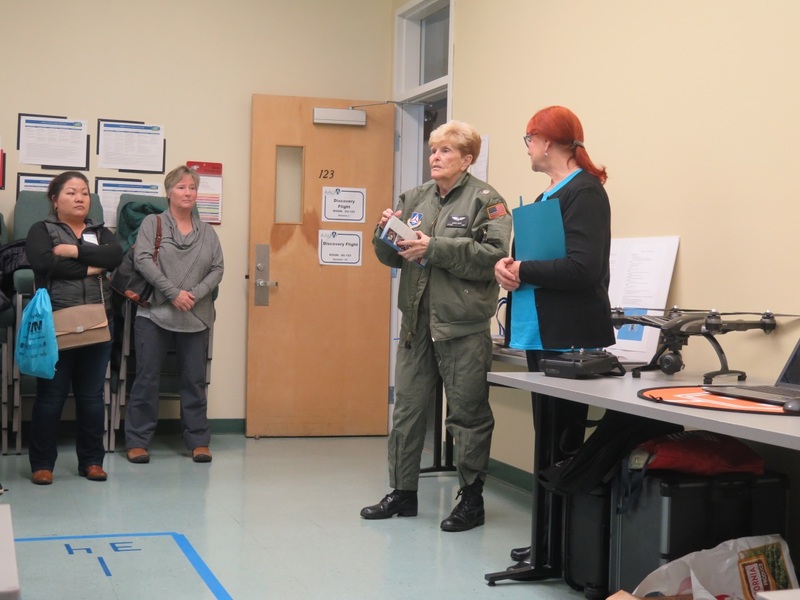 Nancy Overton headed the “Discovery Flight” simulation with Barbara Crooker, Julee, Garrett, and Sarah Ludlow assisting. Mock runways were taped off on the classroom floor with Barbara Boot stating a brief rundown of what is necessary as a check list prior to a flight. Most of the girls were able to “fly” a tower instructed take-off to the Sundial Bridge and a tower instructed landing for a complete go around. Their bodies were their own “pilot” and “airplane”. 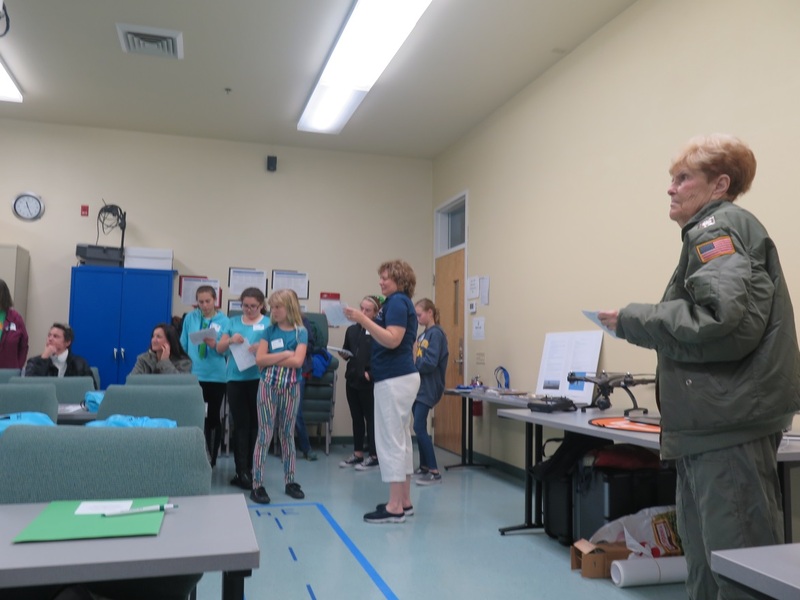 Besides the “Discovery Flight” activity, Barbara Crooker had Young Eagles handout for the students, and told the students about the opportunities Young Eagles offered, and Barbara Boot mentioned some of the scholarship opportunities for women pilots and student pilots. 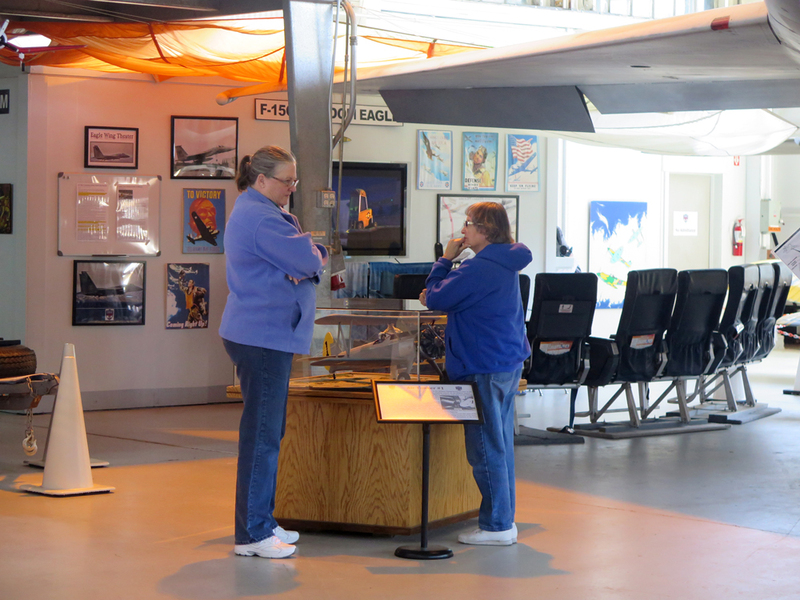 Nancy Overton gave a brief description of how the 99s evolved with Amelia Earhart’s help. Julee Garrett had a video presentation of some of the recent Space X launches, including the launch of a space ship with a car. She gave some of her personal experiences from her time at NASA and how there were few women in the field when she started her career. 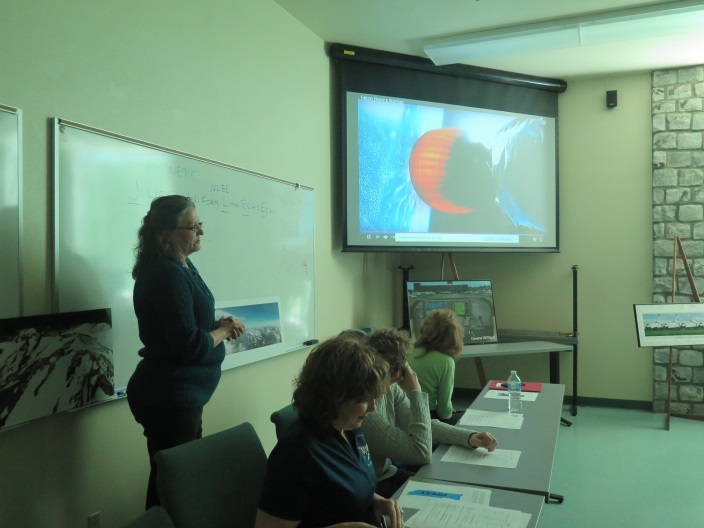 The students were riveted to the presentation with the pictures of space ship successes and failures on launches and landings. Julee emphasized the importance of mathematics to enable these launches to be successful. Sarah Ludlow gave a presentation on her first solo flight. She had a video of this flight, and gave the students a first-hand experience of how she felt. Sarah was only 16-years old for her solo flight. Diana Ward gave handouts for the Civil Air Patrol and encouraged the students to come to their meetings. Tony Miller created a drone display including filmstrips for the girls to view, and Lerose Lane gave a short presentation on the future of drones in aviation. Also, a big thank you is deserved by Eric Marshall, Bryant Garrett, and Tony Miller for their help in making this STEM Conference a success! 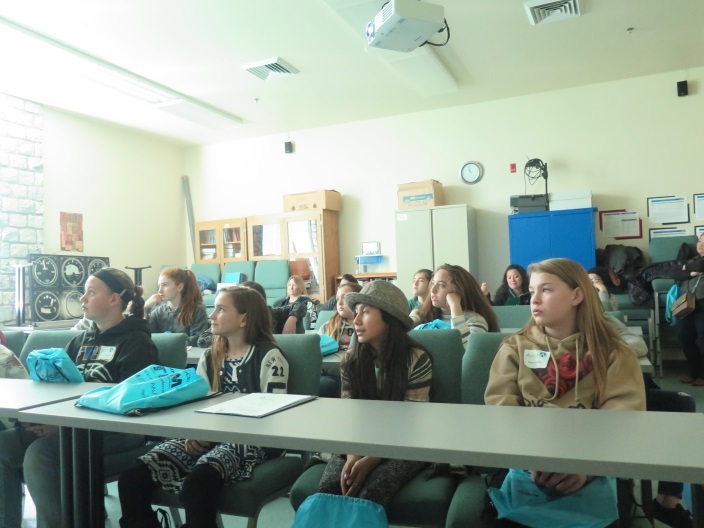 The annual Women in STEM Conference is organized by the Redding branch of the American Association of University Women as a way of motivating the girls to pursue technical and scientific career paths. 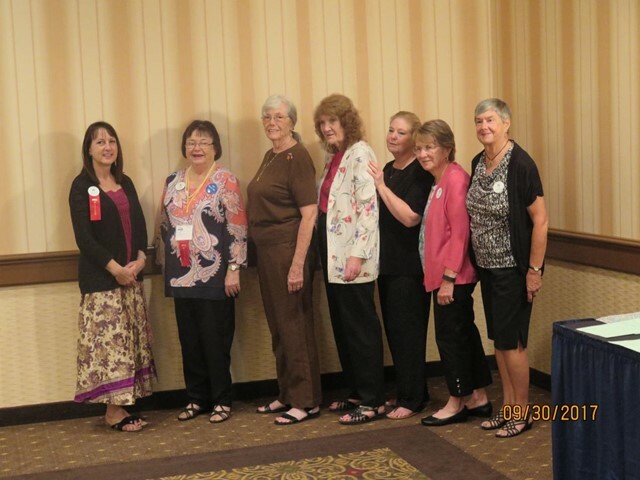 For the first time in over 20-years, the Fall 2017 SW Section Conference was held in Redding, California, at the Red Lion Hotel. There were many fun activities, besides several educational seminars. It took our Mount Shasta 99s, and the Redwood Coast Flyers several months of in depth planning to make this a section conference as one to remember. 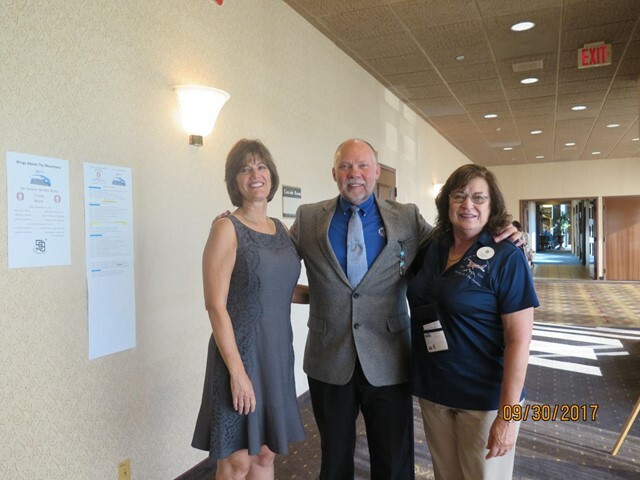 The seminars were on pilot nutrition by Ann Orton, and ABS-In and ABS-Out by Irwin Fust. Our fun activities included kayaking on Whiskey Town Lake, CalFire Tour, Turtle Bay Tour, golf at Lake California Golf Course, and a grand tour of Shasta Dam. 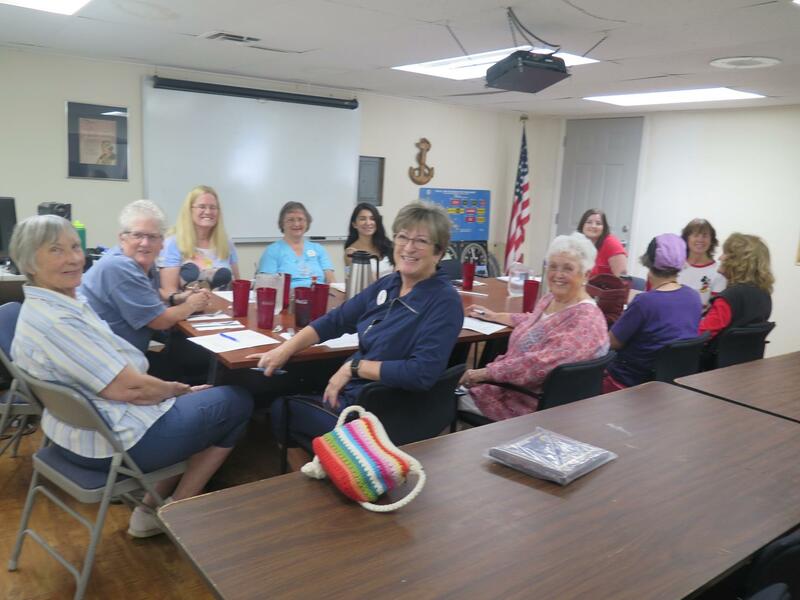 The kick-off was held as an evening welcome meeting on Thursday, September 28, 2017. For Friday night, there was dinner at the Cook House overlooking Shasta Lake, which included a delicious Mexican buffet. This meeting was exceptional for the number of 99s who flew to this event, and landed at Redding Municipal Airport. The fly-ins were greeted by Sue Kerr, Julee Garrett, and Lerose Lane. Altogether, there were 22 airplanes tied down at Redding Muni by 99s for the conference. At Saturday’s business meeting with Alice Talnack, SW Section Governor, there were two guest speakers. Guest speaker, Laurie Baker with Shasta Cascade Wonderland Association, gave a Power Point presentation on the recreational opportunities that Redding and the surrounding areas offer to visitors and residents. Guest speaker, Bryant Garrett, Airport Manager for the City of Redding, gave an update of ongoing and future projects for both Benton Airport and Redding Municipal Airport. Plus, the Redding Civil Air Patrol presented the colors for the Pledge of Allegiance. Alice followed up with how electronic voting is going to implemented, and other business at hand. 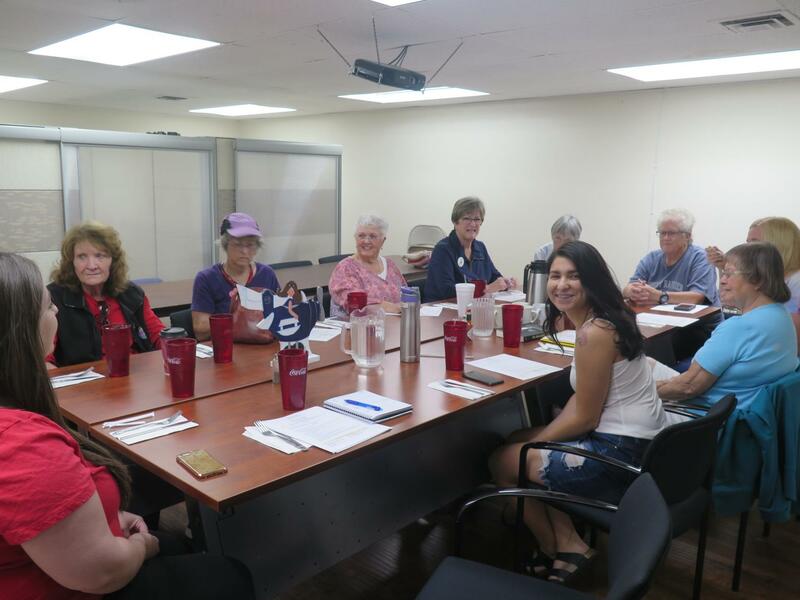 Bakersfield Chapter presented their upcoming meeting for the SW Spring Conference, to be held in Bakersfield staring on April 27th and ending on April 29th, 2018, at the Four Points Sheraton Hotel, Downtown. This upcoming business conference will include music and arts for our pleasure. 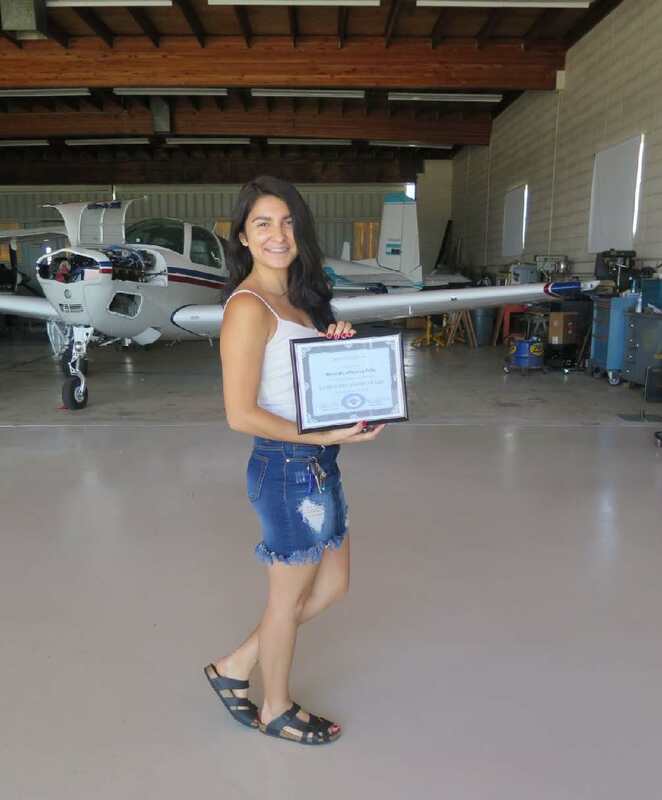 The Professional Woman Pilot of the Year Award for 2017 was awarded to Renee Sandell at the business meeting early because she had to leave for work. 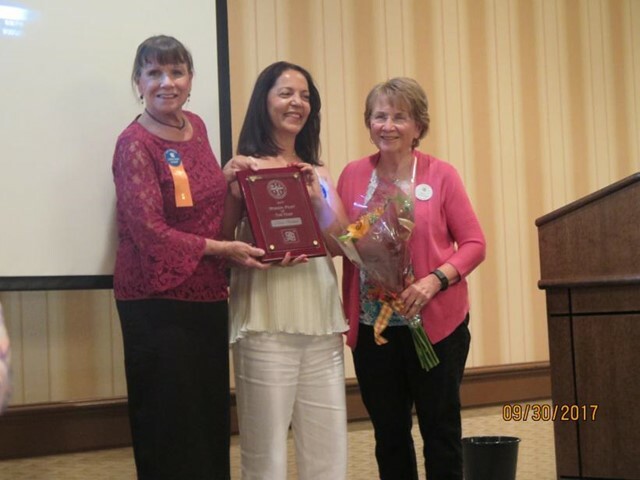 Shown below is a picture of Renee receiving the award from Linda Mae Hivert, and Paula Sandling holding Renee’s flower gift. 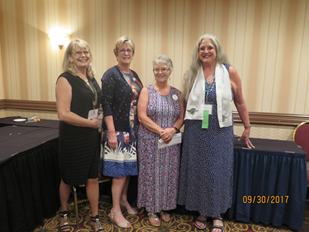 The dinner/awards was officiated by Lerose Lane, Chapter Chair, Mount Shasta 99s, and Rose Hanan, Chapter Chair, Redwood Coast Flyers. 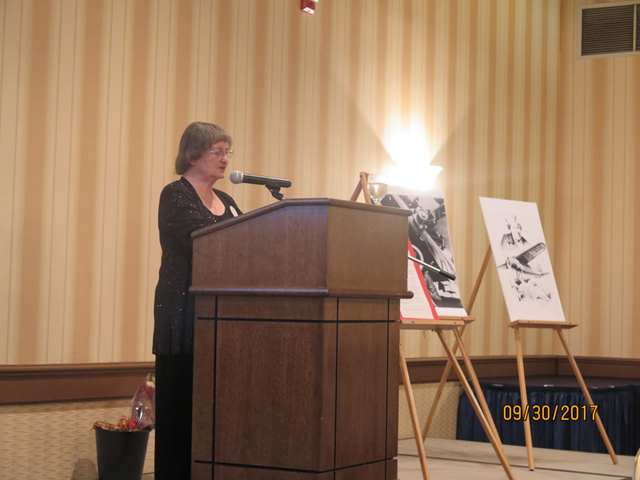 Rose gave a short memorial in honor of Kay Gott-Chaffey. After being a WASP in WW II, she got her master degree in Education from the University of Oregon and went on to teach at Humboldt State University in Arcata, California. 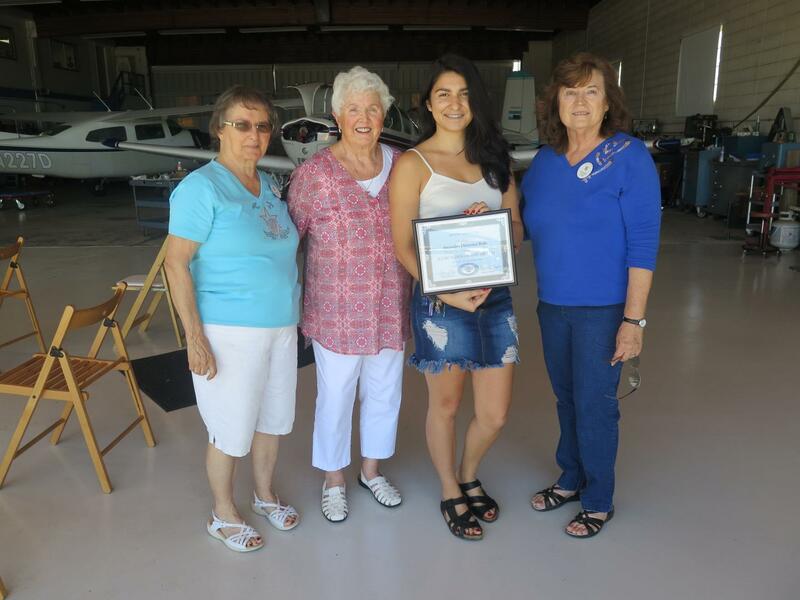 Kay continued with her piloting skills, and had a commercial pilot’s license. She helped fly relief missions in Northern California during the 1964 floods. 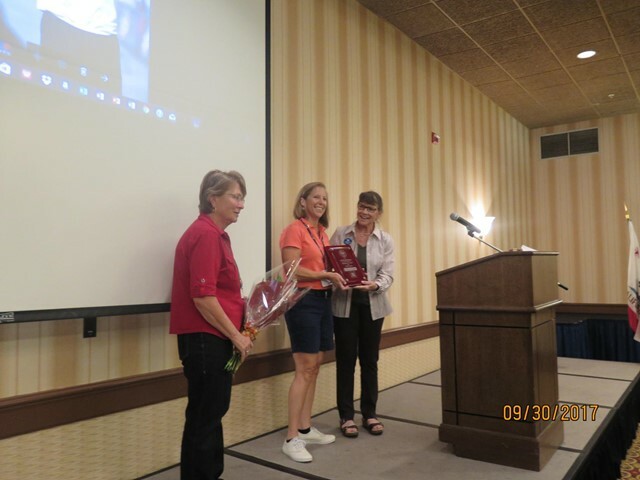 At our Saturday dinner meeting, Paula Sandling with Linda Mae Hivert, awarded Nora Feddel with the Woman Pilot of the Year Award. The dinner/awards was also highlighted with a live auction and notice to the silent auction winners. 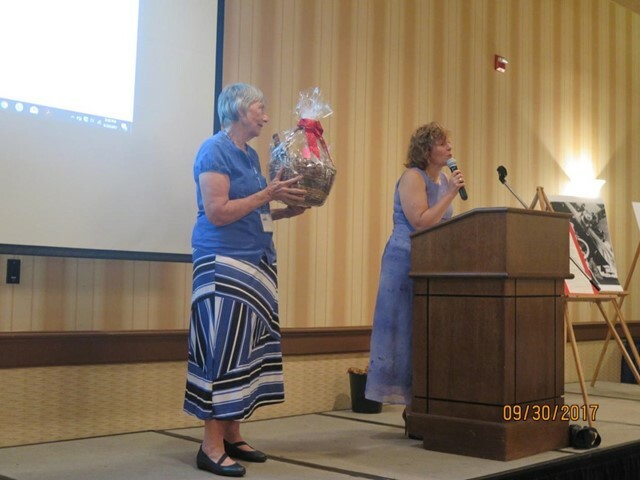 Nancy Overton-Marshall was the auctioneer, with Sue Kerr assisting. 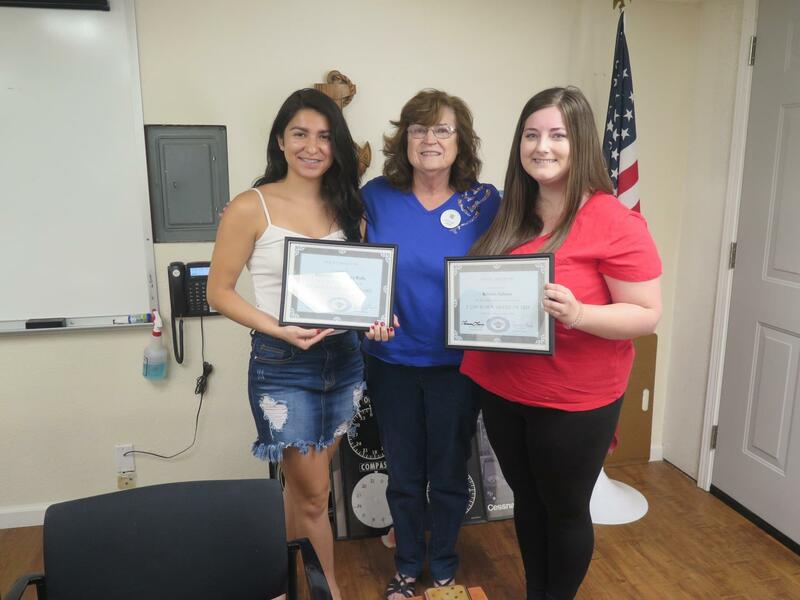 Jeanne Fenimore awarded the Monterey Bay Chapter with the PR Award, and also gave recognition to the long-time 99s members. 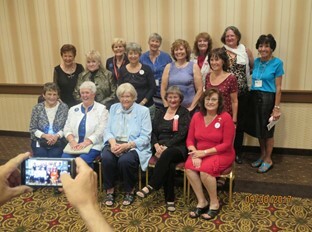 Many long-time members were present. What made this meeting successful was exceptionally hard work by many of the Mount Shasta 99s and the Redwood Coast Flyers. Rita Limmer organized both the Hospitality room, as well as the Fly Market. Nancy Maas organized many of the tours as well as most of the transportation, along with Diana Ward. Julee Garrett organized the kayaking activity. Barbara Crooker handled the registration along with Barbara Boot. Lerose Lane produced most of the printed materials. Barbara Boot had a very interesting presentation on Amelia Earhart including a slide show which had many interesting pictures showing Amelia life experiences. This event was not only fun, but it was profitable for both of our chapters.